Canada eTA cost and price - How much is it ? Plan your travel budget: How much does an ETA cost? Over the next few days, weeks or months, you are going to fly to Canada. And like every trip, you have to prepare yourself financially! This is the best way to travel without stress, and it is highly recommended. After drawing the itinerary, take out your notepad and make the “check-list” of all expenses before and during your stay without forgetting the compulsory formalities including the travel authorization which is a new entry requirement if you want to fly to the Eldorado of the northern part of North America. 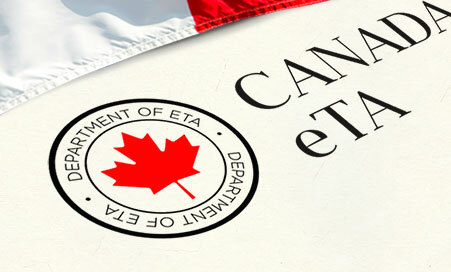 Like the US ESTA, the ETA is replacing the VISA if you want to fly to Canada. All foreigners, including, children and adults, wishing to cross over the beautiful landscape of the caribou country have to possess their own ETA. Without it, there will be no Banff National Park or Canada’s Wonderland. Belgians, French, Swiss, Israelis, or Taiwanese tourists can visit all the tourist spots of Canada as long as they got their ETA. Only Canadian citizens with dual citizenship, permanent residents and US citizens are not affected by this requirement. However, proper identification must be presented. BUT, you don’t have to worry because applying for an ETA can be done remotely, as technology has made a great service to globe-trotters. Moreover, the process is simple and affordable. It only takes a few minutes to fill your application form and submit it. All you need is an internet connection and your passport. Only regular or ordinary passport, diplomatic passport, official passport, service passport, emergency or temporary travel document, refugee travel document, travel document issued to non-citizens, permit to return to the United States and title of travel for refugees of the United States are accepted to fill the application. All you have to do is complete a downloadable form of the travel authorization on the website of Canada’s Government. Before you submit your application, review it carefully. Make sure it is complete and accurate. Entering incorrect information could lead to a delay or even a refusal of your ETA application, and/or prevent you from boarding your flight. What is the budget to foresee? On the financial side, the ETA will not swallow up your budget and price. The ETA cost is not expensive, a real bargain for those who want to enjoy a family trip or a business trip at a reduced price. This means that every traveler must have their own electronic travel authorization. This amount will have to be paid by credit card during the submission of your file. The validity of an AVE depends on the validity of your passport and can be up to 5 years. Once you arrive there, you only have to present the passport that is linked electronically with your ETA and Canada is all yours!